Fits iPad (6th gen., 2018 and 5th gen., 2017), iPad Air 2*, and iPad Air. *Please note: iPad Air 2 side mic above the volume buttons is obstructed by Big Grips Slim and may limit functionality with some apps. The rear mic is unaffected. Big Grips Slim is a bit squishy and very lightweight, so it's easy to pick up and carry around. Big Grips Slim has full back protection with easy access to all ports and switches. 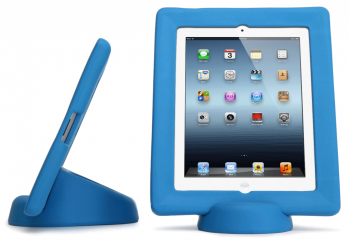 Big Grips Wedge is the indispensable, space-saving stackable stand for Big Grips Slim. *Although we can’t guarantee the safety of your iPad, the manufacturer offers a 1-year limited warranty on all Big Grips products. Big Grips Wedge Stand is the indispensable, space-saving stackable stand for Big Grips Slim. Big Grips Wedge is 4.75" x 6.75" x 2.875" (121 mm x 171 mm x 73 mm) and weighs approximately 3.5 oz. (.10 kg).